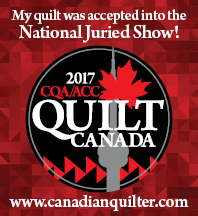 Not in love…with my quilt blocks! This is not the first time I abandoned my blocks. A couple of years ago I was working on Spring Garden Sampler by The Rabbit Factory. It was time to find a backing for it. I searched through my stash and found a whole pile of appliqued blocks that I had forgotten about. I decided to include the forgotten blocks in the backing. So… my abandoned quilt blocks always make it into a quilt…just not always on the front!! These are the abandoned blocks that will some day grace the back of a quilt!